. Published on November 27, 2017. Even with all the advances the internet has brought to businesses, customers still prefer to speak to a real person — or at least to know a real person is there if needed. Web-based communications have now evolved from “live chatting” to an even better option: Click-to-Call. Once websites began to be seen as a marketing tool, companies started brainstorming on what drove people’s online purchasing decisions. The issue became even more crucial when e-commerce started to emerge, as there was competition with physical stores — a rather hard task as it turned out. It was discovered that one of the major features that can turn website visitors into customers is human interaction. A number of studies conducted on this matter revealed that 54% of customers want reassurance from a real person before completing a purchase and 44% of online customers say that having their questions answered by a live person while making a purchase is one of the most important features a website can offer. The most basic thing that business owners can do is to put their phone number on the website. But even if you have your phone number displayed on every page, your visitors will still need to grab their phone and dial, which is not always convenient. Customer-focused companies started searching for more efficient ways to provide even better customer service. It was soon discovered that here, like in any other field, true success lies in proactivity. As a result, LiveChat solution was born in 1998. LiveChat is a chat window that pops-up or just sits on page reminding the visitor that they can receive help at any moment. While this feature proved to be effective, it is hardly suitable for small businesses, as they often don’t have an employee solely responsible for handling customer chats. Besides, most customer-business interaction is done by phone, especially when you need to set up a meeting or you have a complicated question to ask. 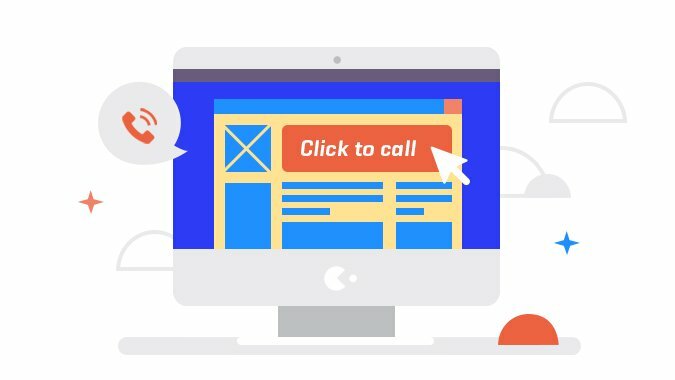 That’s why, when the Click-to-call feature appeared, it was quickly adopted as a means to increase website conversions, as it’s much easier to interest prospects through live conversation. Click-to-call is a simple feature that lets people call from a website and the call is routed as if it were placed from a regular phone. Unlike toll-free, which comes with no charge for the caller, but not so much for you, a click-to-call feature doesn’t cost you a dime. As the connection is established through the internet, it is absolutely free for both you and the caller. The caller doesn’t have to reach for the phone and dial the number. The call is placed in just one click. It is not much hassle to put it to the website either: there are just few lines of code to embed to the website. Click-to-call feature allows calling from any website page your prospective client is on. You can route all calls from website to a single person, or route calls to different members of your team depending on the page the call has been placed from, providing more professional assistance to your customers. Once the call has been made, you know the page it came from. This way you can collect statistics that will help you estimate the pages of your website that work better and what kind of content/feature your customers are more interested in. In return, your website visitors can get their inquiries answered very quickly, which can greatly influence their buying decisions. Ability to provide immediate assistance works well for your image and lessens the chances that people will get tired of waiting and move on.Whether it’s an online store, a local restaurant or a repair shop that you own, people will always have a question to ask, need to make a reservation or set up a meeting. When they want immediate results, click-to-call provides them with this option. Give your customers a chance to reach you on every step of their journey through your website and they will give you that call.